Rendering (left) by James Corner Field Operations showed a series of lighted globes. Illuminated mock-up of stainless steel lantern form by Blessing Hancock (right) features cut-out text of original poems by Minneapolis writers. It’s as if James Corner Field Operations was channeling artist Blessing Hancock’s work when the landscape architecture firm produced a conceptual illustration for the west side of Nicollet Mall between 6th and 8th Streets. 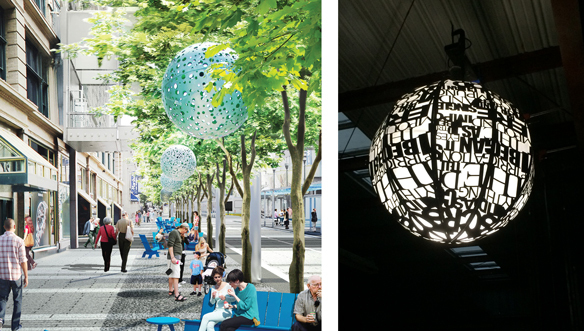 The firm’s rendering showed a series of textured, lighted globes lining the street, peeking out among the tree foliage. The globes signaled an opportunity for public art that could parallel the Light Walk they had designed for the street’s east side. Hancock’s work is well-known and may have provided the inspiration, but what makes her Nicollet Lanterns personal and unique to the Mall are the powerful contemporary poems by local poets that will activate their surfaces. Hancock was chosen by the Artist Selection Committee after a nationwide open call. Engaging the community is frequently part of her working process and in her application and interview, Hancock emphasized her enthusiasm for working with local writers to develop text especially for the lanterns. Through Coffee House Press and the Loft Literary Center who assisted with the project, she invited local emerging poets and prose writers to create original works of writing. who have some evidence of professional achievement but not a substantial record of accomplishment; writers who had not been previously published were also eligible to apply. Writers responded to the theme “Nicollet Illumination” which Hancock conceived to include four concepts: Spark, Glimmer, Shine; Speed, Momentum, Change; Knowledge, Insight, Expertise; and Culture, Enrichment, Distinction. 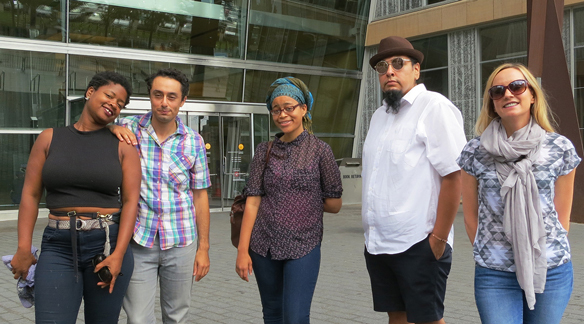 Artist Blessing Hancock (on right) with writers Junauda Petrus, Moheb Soliman, Sagirah Shahid and R. Vincent Moniz, Jr. (Nu’Eta). Photo: Regina Flanagan. Junauda Petrus, Moheb Soliman, Sagirah Shahid and R. Vincent Moniz, Jr. (Nu’Eta), all of Minneapolis, were selected from a pool of 83 applicants based upon the quality of samples of past work and their potential ability to develop written works for the lanterns. They were among eight writers who participated in interviews with Hancock to determine their compatibility with the artist, and potential for working on this collaborative project. The writers were challenged to create three approximately 100-word poems or micro-prose pieces to incorporate into the lantern forms. The final text is being cut into a multi-faceted spherical shape like a sectioned-orange four-feet in diameter. The words are readable in short phrases or fragments, and the form itself sets up interesting juxtapositions of text and meaning. To read about the design of the lanterns and learn more about the young writers and the poems, click here.